If you are deciding on a closet remodel, closet renovation or to build a closet organizer for your home; you have the choice between a custom closet system made by a professional closet builder or stock closet storage systems from a hardware store. Most people agree that a custom-designed closet or closet organizer with all your clothing, footwear and accessories in sight and at arms’ reach is desirable. They make your closet more than just a storage space—you’ll enjoy spending time in it and showing it off to friends. However, we’ve realized that the decision process is not as clear cut as one might think. We have put together the comparisons below to help you with the decision process. Home Value Custom made closets add incredible value to your home. A custom built in closet compared to a stock closet solution makes it more desirable to a potential buyer. 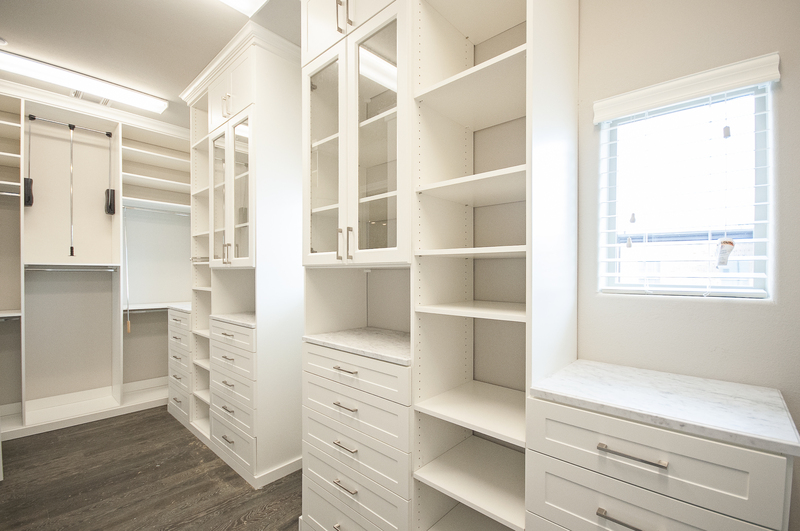 Stock closet organizer cabinets are unlikely to impact the value of the home since the stock closet organization solutions will not be a reason a buyer would want your home. Modifications, changes and upgrades A unique feature of custom closets is that they can be modified or upgraded after the original installation to meet your changing needs. You may want to change out a shelving section for a hanging section or a short hanging section for shirts to a long hanging section for clothes. Usually they are built to meet specific design criteria and can’t be modified later on. Cost Custom closet solutions are likely to cost more since all of the work is done for you. The cost to build closets designed for your home is surprisingly not as much as you might think and usually worth the difference by a long shot. You will likely pay less for a stock closet system since you carry out the design and installation of the system. Process A closet designer visits your home and measures the space, discusses your needs with you and produces a design. The system is custom manufactured for you and your closet system installation is done by professionals which means you get a warranty. You measure your space and design your closet organizer system. You shop for the system online or instore and get it shipped to you or you pick it up. You install is yourself if you have the skill level to do so or hire a handyman to install it for you. Style Since you are free to choose your own design, you can also see for yourself if the design will blend in with your house’s interior. Like if your theme is contemporary, your custom closet organizer will be designed according to that theme or however you wish. What you see in the stores is what you’ll get. Usually, the specifics that you are looking for in the closet organizer system may be hard to find. You will have to settle for what’s available. Like for example, limited designs and sizes. Timing The entire process from design to installation typically runs from 2 to 6 weeks depending on the complexity of the project Fast: Usually these closet organizer systems are readily available (apart from shipping time) and ready to assemble. So which works best for you? It depends – you may opt for stock closet organization systems due to time constraints or budget or perhaps for property you plan to rent out. You may determine that custom walk in closets work best for you if you own the property, want a custom designed closets to match your specific storage needs and style and if you think your needs might change in the future and you want a system that can grow along with you.